Here is a medium sized steel pilothouse yacht of modern styling, with the strength to take you to far corners of the world and the pace to do it in reasonable time. Cutting files for steel and aluminium available. See our kits page. See the Dix 43 for the same hull with a trunk cabin deck with either aft or centre cockpit. Fifteen years ago the number of requests which I received for pilothouse cruisers was minimal. People would ask, almost in passing, about designs with inside steering or raised saloons. All that has changed and I now receive serious enquiries for such boats on a regular basis. The reason, I think, is partially due to the disappearing ozone layer and partially due to cruising people wanting a bit more comfort. This yacht has the facilities needed to sail with good visibility under full protection or to entertain in style when in port. 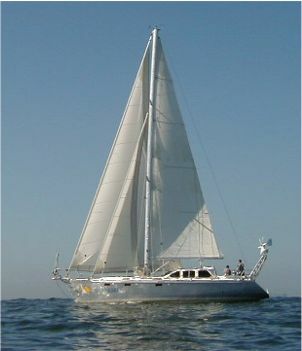 The basic hull has been well proven, with many Atlantic crossings and passages between Cape Town and the Indian Ocean islands. Heavy weather does not phase them either upwind or down. One has surfed at over 20 knots in complete control, phenomenal for a steel 43 footer. The underbody is clean, with a fine bow and powerful stern. Keel options are fin or shallow draft wing and the rudder is protected by a full skeg. With her long waterline to carry her structural weight, she has a good displacement/length ratio of 238. With a sail area (main + 100% fore-triangle) of 90,64sq.m she has a sail area/wetted surface ratio of 1.94 (or 2.43 with main and genoa). These result in a boat which has the power to push through rough conditions and the ability to keep moving in the light stuff. Down below she has berths for 6 in three spacious double cabins, each with hanging and shelf lockers. The berth cushions are divided longitudinally to permit fitting lee cloths for heavy weather comfort. One heads was considered sufficient for a boat of this size and reduces complications. The forward position of the galley gets it out of the main traffic area of the pilothouse and gives it more space for a really large freezer and lockers. The sinks are positioned close to hull centreline to eliminate the drainage problems of the forward and outboard position more commonly found with this sort of galley positioning. The U-shape as drawn increases work surface area and makes it easier to strap in when needed while still permitting the cook to work at the cooker but slightly out of the line of possible spills. The pilothouse itself contains a raised dinette to seat 8 with elbow room. The table has folding leaves to give room to stretch out and relax. The island seat on centreline is over the engine and can be removed in one piece for engine maintenance or, for routine engine checks, there is a side access panel. The inside steering position has a hi-lo swivel chair used for steering or working at the nav table. The dropped cabin sole along the starboard side of the pilothouse gets the nav table well below the side deck to increase its size and give lots of space outboard for lockers, electrics and electronics. For those not wanting inside steering the space can be given over to a larger nav table and lockers or wet bar. The double quarter cabin has its access from the pilothouse and results in a bright and airy cabin. The raised cockpit also increases the volume of this cabin to reduce the claustrophobic feel which many such under-cockpit cabins give. The large lazarette is accessed by removing the companion steps, to eliminate the need for a cockpit hatch into this area. Cockpit hatches under the contoured helmsman's seat lead to lockers for gas, fenders etc. The cockpit drains directly through the transom onto the boarding platform to eliminate some thru-hulls. The large T-format of the cockpit gives plenty of space for working and socialising and allowing the person on the helm to move well to weather or leeward. Deck contruction options are steel or plywood. The rig is a large and powerful cutter. It can be fitted out with roller furlers on both forestays using the genoa for light to moderate conditions and the staysail for heavy weather. Alternatively, use of hanks or a luff foil will increase flexibility and give the alternative of setting the handy and powerful combination of yankee and staysail for intermediate conditions. Construction is steel, designed in excess of the requirements of the ABS Rules for Offshore Racing Yachts. The hull shape is radiused chine steel, a form which has now been widely accepted by our clients to produce a round bilge hull shape with no more complication than multi-chine construction. Similar hulls from 30ft to 65ft are being built by amateurs and professionals with great success. This design will give a very able cruiser, strong enough to take her crew wherever they want, in style and comfort and will not take forever to get there. It is also available in aft cockpit and centre cockpit versions as the Dix 43. 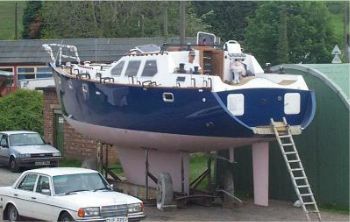 For a smaller boat of similar concept see the Dix 38 Pilot.